It should come to no surprise that Coco and the Butterfields is from Canterbury, a historic English cathedral city; the band’s music is downright regal. 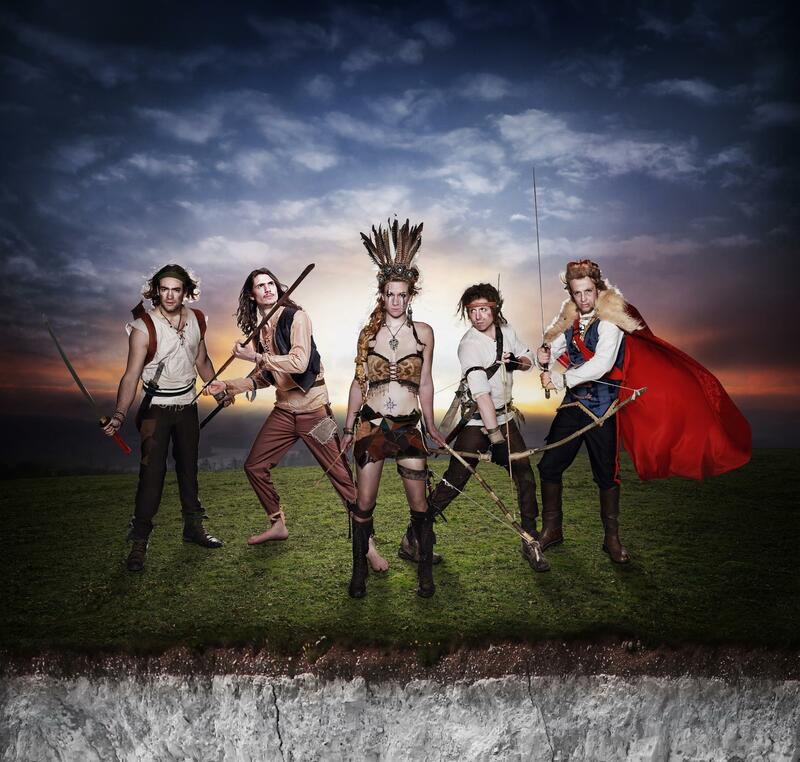 As the photograph (an eclectic amalgam of Pocahontas and Braveheart) above suggests, the band combines traditional English pop with pastoral folk and gritty hip/hop to create a tremendous sound that has not only sparked its own derivative genre (“Fip Fok” – folk/pop/hip-hop) but also has expanded the ears of listeners while sucking them into an infectious sound. What? Did I look into the picture too much? It should go without repeating that I am a big fan of what Coco and the Butterfields is creating, but, heck, I’m going to bedizen the group with flashy adornments of praise. The music is fresh and original. Original is an understatement. The five-piece band combines the folk prowess of Micah Hyson (double bass) and Rob Wicks (banjo) with the filthy and fresh beatbox stylings of Jamie Smith. Folk and beatbox? It takes a rare breed of band to pull off that stunt successfully. Just take a listen to the band’s glorious cover of “Just a Dream” by Nelly. It is unconventional (almost humorous in its musical absurdity), but after the initial shock sets in, it is not difficult to imagine the song being a Coco original. This is the mark of a great band. “Warriors” takes effervescent to a new level. The music is off-the-bubbly-charts. If you do not have the sudden urge to get up, jump up and down, and sing along to the track than something must be terribly wrong with you. In a style similar to fellow countrymen Skinny Lister, Coco and the Butterfields combine a traditional folk instrumental with fresh elements. “Warriors,” though, maintains a unique theatrical feel that creates a big-screen appeal. It also maintains a dangerous contagiousness that invokes constant repetition of the song…seriously. The song is a gem. This band needs to make its way to the Big Apple, so I can hear the song live – yes, I’m selfish. Heck of a song from one heck of a band. Get on the Coco and the Butterfields train. Follow the band on its Website, Facebook, and Twitter.